Looks like we have another scam on our hands! We have just added Secure Home Profits to our scam list of 2015, and it appears to be a duplicate scam site too. Read the review before you provide any details on their homepage. Secure Home Profits scam is a duplicate scam site that contains almost identical layout and information as two other work from home scams, namely Ultimate Home Profits and Home Starter Career. Fake news websites pitching get-rich-quick schemes is no longer a new tactic, but not many people are aware of it. This tactic has been around since 2011, and it has been announced as illegal since then. However, there are still many scams that use fake news to lure people in because it appears credible, and Secure Home Profits is one of them. When we read a news, we tend to lower our guard and become more susceptible. 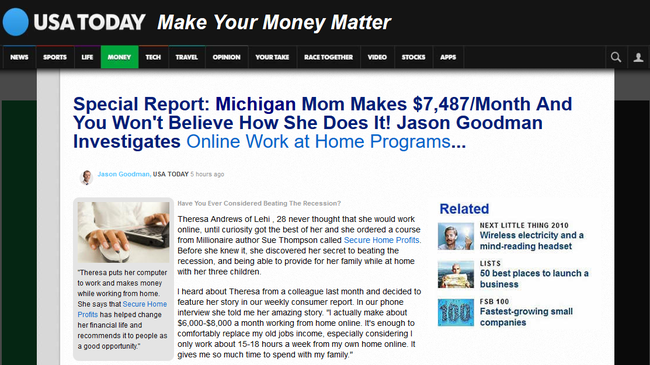 You have to be extra vigilant when you come across a piece of “news” that boasts making easy money online. Try to click around the website and you’ll realize that every link leads you a same external website (which is the scam site). In the example above, literally every button and link that I click brought me to securehomeprofits.com. This alone was enough to alert me that Secure Home Profits is probably a business opportunity scam. When you are directed to Secure Home Profits website, you will be immediately fed with hypes of the possibility of making money online within 5 minutes. While this is possible in the world of internet, these scams often try to make it sound as simple as possible to pique your interest. It’s usually normal for websites to request for your name and email address to register for an account. But when a relatively unknown website asks for more sensitive information such as your phone number, you should be on your toes. I have an old number that I use for scam reviews, and I receive unsolicited calls from unknown numbers pitching me make money programs on a daily basis. This is what will happen if you provide your phone number to scam sites like Secure Home Profits. Your phone number gets circulated and sold to other shady companies trying to separate your money from you. Don’t provide your phone number. For this review, I gave my name and old phone number to proceed to the next page. 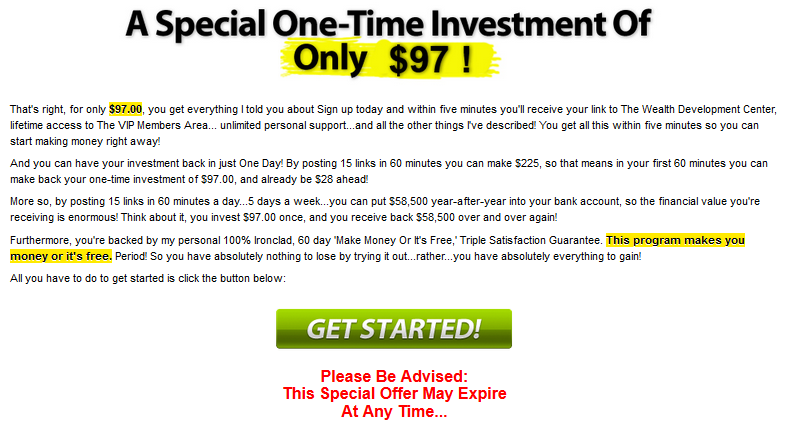 Once inside, you’ll be “offered” a home based business job to make $379/day from home spending only 60 minutes a day! If this is not blatant hype, I don’t know what is. Notice the urgent update that follows the claim? It’s just there to give you a sense of urgency, so you will skimp through the rest of the sales material and buy the program quickly. Speaking of the sales material, there isn’t much content except for creating more hypes and the illusion of easy money online. Secure Home Profits is a typical link-posting scam, claiming that there are companies out there desperate to pay you good money in order to post some links for them. Let me get this straight – there’s a lot of money to be made online, but it isn’t made this way. This is simply a scam out to get your money, and gives nothing in return. Why would a company pays good money just to have someone post some links for them? Have you came across a job that needs you to pay to get started? Me neither. Anyway, I decided to play along and clicked on “Get Started!” to see what they have in place. No surprise here. If I pay $97 and I will get access to Secure Home Profits system, along with their complementary weekly training series for free. Sweet deal. Just as I thought I was done with this review and decided to close the browser, a wild pop up appears! What surprised me wasn’t the discount, but that they were offering “$120 discount” for a $97 product. Who has time for proof-reading when you are busy creating scam sites? Another attempt to close the browser will drop the price further to $47. These were attempts to entice me into buying the program because I wasn’t sold. People get excited when they are offered discounts, especially when the price is slashed to half the original price. There will be people who buy into this due to impulse alone. Unfortunately, Secure Home Profits is one of those deals that are too good to be true. Should I Buy Secure Home Profits?